In order to service the four lanes, a stroke in excess of 40 inches was required and the lane changer needed to index on average every 10 seconds or less while maximizing time available for product flow. In today’s high-paced society, speed is a way of life. Such is the case in the industrial automation market, as an increase in speed results in an increase in production rates. Increased production rates, in turn, lead to increased profit, and higher profit margins are something that every company strives to achieve. In the instance of case packing machines, whereby a machine or person moves a product down a conveyor to be packaged, it is important for manufacturers to move a large volume of products in a short amount of time. The case packer must not only be fast, but also cost-efficient and durable enough to ensure a long lifespan. Over the last few years, RPT Motion, a provider of custom modular linear motion systems, has experienced an increasing demand for case packers and other linear motion solutions from manufacturing customers across the board. “So much of our business is driven by speed,” says Peter Ratcliffe, President of RPT Motion. Based in Quebec, Canada, RPT has been providing solutions for industrial automation applications since 1984. “Our customers have always looked to us for ways to speed automation, but in light of the recent globalization, we have observed an intense pressure to provide solutions that reduce downtime and thus, increase overall productivity,” said Ratcliffe. A key segment of RPT’s business is based upon updating existing subsystems on machinery with higher performance linear motion to increase production rates and reliability. Although speed is a critical component for linear motion applications, size plays a significant role as well – that is, increasing speed without affecting a machine’s or sub-assembly’s dimensions. This is because changes in dimension necessitate re-design, and re-design costs money. Recently, RPT Motion teamed up with Kerk Motion Products, one of the world’s premier manufacturers of non-ball lead screws, for a challenging retrofit project involving a major tissue manufacturer whose operation was getting bottlenecked at the case packing stage. The manufacturer was looking to add a second case packer to its process in order to increase the speed and prevent the slowdown of its current production. However, the process required more than just dropping in the new case packer. The first obstacle lied in the fact that the existing system, which had a two-position lane changer powered by a pneumatic cylinder, wouldn’t provide the four required positions or the higher speeds. In order to service the four lanes, a stroke in excess of 40 inches was required and the lane changer needed to index on average every 10 seconds or less while maximizing time available for product flow. To tackle this formidable motion control challenge, RPT teamed with Kerk to design and provide a motion system to feed the required four lanes (two lanes in each of two case packers). The two companies collaborated to include a Kerk screw and nut in the RPT Modular Slide System, creating a smooth running, high-speed, servo-powered system, with an Anti-Backlash Lead Screw Assembly. The new system featured Kerk’s VHD Series of lead screws, which come in a variety of different leads in the same size physical package. Components to mount the nut, as well as to support and drive the screw remained the same over a huge choice of feeds and speeds, and therefore potential uses. In order to meet the high speeds required in this lane changer application RPT, chose a 2.400” travel per revolution screw of ¾” nominal diameter, which proved to have approximately the same efficiency as a ball-nut configuration. The servo-powered system achieved the speeds necessary to accommodate the second case sorter and subsequently eliminate the manufacturer’s bottleneck – within the confines of the system’s original dimensions. “The lane changer initially functioned without failure or even noticeable backlash for three years, which is typically unheard of in most linear motion applications,” said Ratcliffe. The use of the self-lubricating Kerk VHD Series was also instrumental in combating environmental challenges. Since airborne tissue paper dust is regularly generated in the cartoning and case packing area, almost everything eventually gets covered in a light layer of dust. Grease, which captures dust and creates a harmful, abrasive paste, is eliminated in this process, as the VHD screw does not require grease to operate. Additionally, there are no greasy ball circuits to be damaged by the dusty paste formed on the ballscrew. According to Ratcliffe, the anti-backlash properties of the VHD screws have proven to be a particularly valuable feature in the system. “Any wear that does eventually occur in the screw or nut is compensated by the patented Kerk mechanism, which adjusts automatically to maintain a zero backlash over a very long service life,” he said. Noise reduction was another key benefit. Because Kerk’s lead screws do not rely on balls or ball returns to generate noise, the new system runs silently, making for a much more pleasant and safer working environment. The RPT/Kerk relationship has spawned other notable technical innovations. 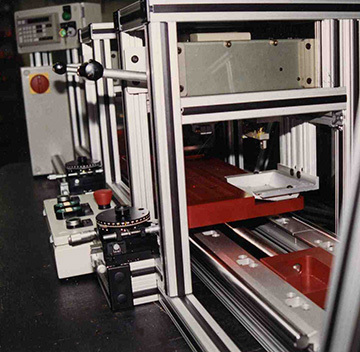 One such innovation was an ink jet printer movement system created by RPT using the Kerk VHD Series that moves the print head on a linear slide. It is an extremely high-speed application where the anti-backlash properties translate to excellent print quality. Another application involved gantry robotics for packaging. “The Kerk VHD system has become the first choice of RPT Motion when addressing linear motion systems,” said Ratcliffe. “It has proven significantly lower cost in most systems than either ball screw or timing belt drives. The Kerk VHD is more predictable and easier to tune than a timing belt powered system and has similar performance at lower initial cost than a ball screw." Because of the Kerk lead screw design solution, RPT Motion was able to deliver a fast, high-quality case packer machine at a competitive price. There is no doubt that the success of this project has presented new opportunities for the two companies to collaborate on future projects. RPT Motion’s relationship with Kerk has allowed them to become a competitive force in the industry, and one can only guess what cutting-edge technology the two companies will collaborate on next.